The pioneering veterinarian and author of the New York Times bestseller, The Dog Who Loved Too Much, and the national bestseller, The Cat Who Cried for Help, recounts his uniquely entertaining—and poignant—stories of treating animals for all-too-human problems as he reveals his amazing breakthroughs with the new science of One Medicine. The Oliver Sacks of animal brains, Dr. Nicholas Dodman is an internationally renowned veterinarian and research scientist who wrote one of the first popular books to recognize the complex emotional lives of dogs and to reveal innovative ways to help them, including with Puppy Prozac. Now, Dr. Dodman once again breaks new ground with the practice of One Medicine, the profound recognition that humans and other animals share the same neurochemistry, and that our minds and emotions work in similar ways. Racehorses with Tourette’s Syndrome, spinning dogs with epilepsy, cats with Obsessive Compulsive Disorder, feather-plucking parrots with anxiety, and a diffident Bull Terrier with autism—these astonishing cases were all helped by One Medicine, which emphasizes the similarities rather than differences between animals and humans. Inspiring, sometimes heartbreaking, and utterly fascinating, Pets on the Couch demonstrates how what we share with our animals can only lead us to a greater appreciation for them—and our mutual bonds. Nicholas Dodman is one of the world’s most noted and celebrated veterinary behaviorists. He founded the Animal Behavior Clinic—one of the first of its kind—at Tufts in 1986. A leader in his field, Dr. Dodman is has published four bestselling books, two textbooks and more than 100 scientific articles and contributions to scientific books and journals, and holds patents for inventions related to the control of animal behavior. Dr. Dodman appears regularly on national radio and television, and lives in North Grafton, Massachusetts. "The fur-and-feathers Oliver Sacks... presents fascinating case studies that suggest animals suffer from some of the same mental disorders we do." "This book will appeal to dog lovers everywhere and should be required reading for anyone who works with animals." "Pets on the Couch may change your mind about minds. This compelling and exciting book will give many pet owners new hope, many vets and MDs new ideas, and inspire all readers with a fresh appreciation for how all animal species—including humans—are deeply and fundamentally connected. Thank you, Dr. Dodman, for your compassion for both people and animals, and for writing a book that itself is powerful medicine." "Who would imagine that a book on our familiar pets could offer so many important insights? I strongly recommend Pets on the Couch for anyone with an interest in animal minds, long misunderstood as nothing much, even by most scientists. The findings of Dr. Dodman, a highly scientific researcher, shows us that the minds of non-humans can be fully as complex and fertile as ours, and sometimes more so. So if you read no other book, be sure to read this one. If you’re of the old-fashioned mindset, your views will change, and if, like most pet owners, you know the truth, you’ll be cheering." 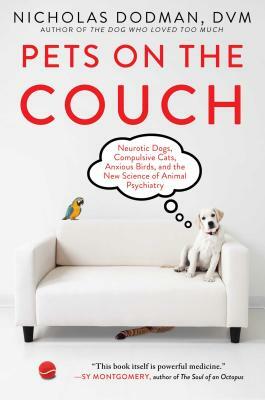 "In Pets on the Couch, Dr. Dodman explores how behavior can go wrong in animals, not just dogs and cats, but horses and even birds. His practice of "One Medicine" simply means that what helps behavior problems in people will also help behavior problems in animals. In a fascinating series of case histories and personal stories he shows how this approach works, even though it was originally met with some skepticism by his colleagues. A fascinating read for anyone who wants to know how the animal mind works." "Dr. Dodman cleverly utilizes his vast clinical experience to deliver a fascinating collection of insightful and essential behavioral tales. The delineation between human emotions and those of the animals in our lives has never been finer." "It is my hope that one day all vets will practice One Medicine, and focus on the similarities rather than the differences between humans and other animals. With much charm and compassion, Dr. Dodman recounts fascinating stories of the various successes with his canine, feline, equine, and other patients. A book for anyone seeking to broaden their understanding and improve their care giving of the animals we love." "How many of us have wished that our veterinarian was our doctor? To know Dr. Nicholas Dodman is to wish he was your therapist. Dr. Dodman teaches us that when we underestimate animals we underestimate all that can be done for them and we most definitely underestimate ourselves. Dr. Dodman has never accepted the limits of what is 'known' and has again and again discovered what is possible."